I started my Power Squadron Class this Tuesday. Its going to last 8 weeks. We got shiny new compasses a study book with homework! and a ruler for plotting. 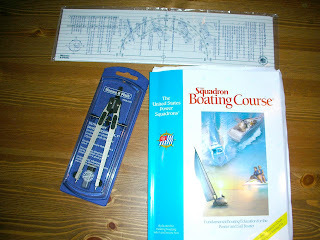 I will be a navigational genius in no time! I hear that being a navigational genius is the new hotness. Power squardon sounds so tough. Good Luck, maybe one day you can navigate your way down here to Florida. Let me know if you start developing abnormally large forearms and talking out the side of you mouth, with an urge to eat spinach.